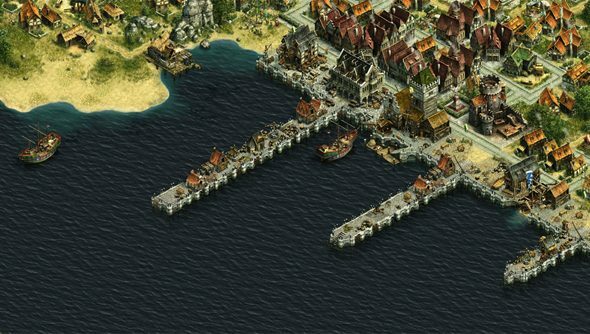 Anno Online is the browser-based variant of the jolly old city-builder. Released last year, it’s just this week introduced nautical PvE combat, and naughty pirates to test it out on. There’s a 5€ starter pack designed to ease in new privateers, but we’re prepared to hand this booty over in exchange for just an email address and a promise of future swashbuckling. The starter pack is composed of a few parts: one pirate chest, in which you might find combat-related items if you’re lucky, and a black sail that “sticks out” and increases the speed of trade ships. You’ll also take on 10 cannonballs, the resource needed to build health kits and enhancers, and one bronze ducat – a coin exchangeable for shop items, and only usually available by defeating the pirate boss in the game’s most difficult maps. The items are worth a total of 2900 in-game rubies. Sign into your PCGamesN account, pop your email address into the widget below, and you’re in for a cannon-shot at a code. If you find one in your inbox, you’ll want to visit the Anno Online site, click on the ‘Vouchers’ tab at the top of the page while logged in, and enter your code into the ‘Redeem voucher’ box. The starter pack’s contents will then be poured into your Anno account, ready the next time you start up the game. We tend to talk about our giveaways on Twitter and Facebook, so do gizza follow. Any existing Anno fans among you?